The Seed Theme is growing! 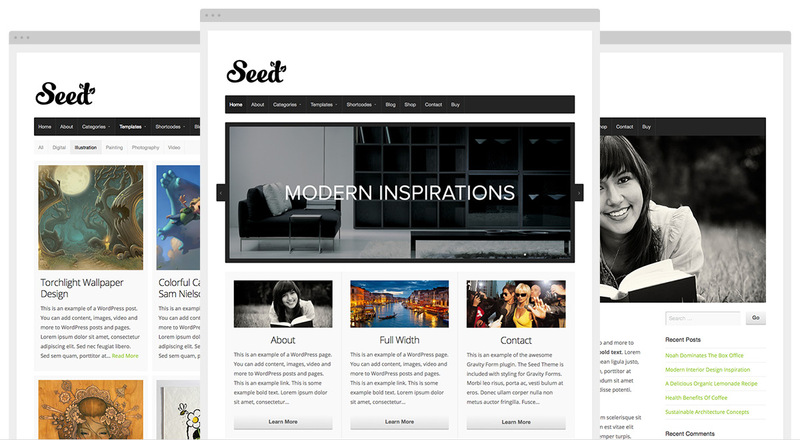 With the release of WordPress 3.9, we have updated the Seed Theme to take full advantage of the WordPress theme customizer. We have removed the Options Framework in favor of adding all theme options to the customizer for a much more seamless user experience. In addition, several other enhancements have been made to the code, and minor updates to the design. Moving forward, all new Organic Themes and major theme updates will utilize the powerful WordPress theme customizer! We are making this transition because the customizer is supported by the WordPress core, and the power, speed and experience of managing a theme with the customizer is unsurpassed. Also, it is inline with the WordPress.com development standards, and will make for an easier transition of our WordPress.org themes to the WordPress.com marketplace. This update adheres to our belief that WordPress is such a powerful framework by itself, there’s no need to pile additional frameworks on top of it. It brings us back to the basics of WordPress theme development — providing our customers with everything they need for a solid, “healthy” WordPress theme, and nothing they don’t. lol .. left this on the wrong post a-duh!!! I’m having trouble with the limits to the audio player in version 1.0.9 of the Seed theme. Are there other improvements to this theme implied in or beyond the move to the WP customizer? If so, where can I learn more? You can review the Seed Theme’s changelog here: http://organicthemes.com/theme/seed-theme/. Please direct any future support questions to our forum: http://organicthemes.com/support, as comments aren’t regularly monitored.